Käthe Kollwitz had a remarkable ability to tap our capacity for empathy. Living in an impoverished section of Berlin, she witnessed firsthand the suffering of the ill, the unemployed, the malnourished, and the bereaved. This life study showing two views of a woman’s head conveys a world-weariness that speaks across time. In the larger study, Kollwitz shifted the position of the woman’s head, emphasizing the hollowness below her right cheekbone. She used fine hatching to bear in on the terrain of the woman’s haggard face. Finally, Kollwitz selectively smeared the chalk to indicate the soft skin of the woman’s lips and eyelids, lending a touch of tender vulnerability to her tough, leathery features. 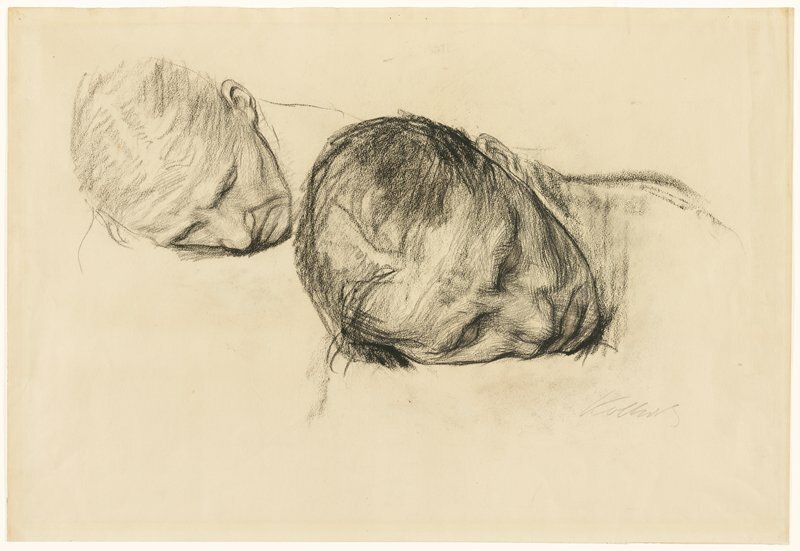 Related works reveal that as Kollwitz drew this study she had in mind a mother grieving over a dead child.